PHOTO BY KEVIN FULLER A committee is studying the future of Calvary St. Andrews Church in the South Wedge. The declining congregation may disband. 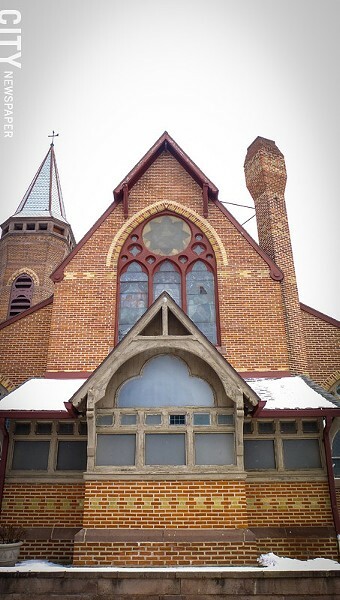 The future of Calvary St. Andrews Church in the South Wedge — if it has one — should become clearer in the coming months. On the table: closing the church and disbanding the congregation, moving the congregation somewhere else, or rebooting the church on its current site. Like many urban churches in recent years, Calvary St. Andrews has experienced a significant drop in participation. It has approximately 50 members, and about 25 regularly come to Sunday service. "We're looking at all options," says John Wilkinson, moderator of the Administrative Commission for Calvary St. Andrews. "We don't want to prop it up just to prop it up. We need to have a vision and mission in order to move ahead." The commission will make a recommendation on the church's future in the coming months to the Presbytery of Genesee Valley. The Presbytery owns the historic church and has the final say on its future. Calvary St. Andrews, on the corner of Ashland Street and Averill Avenue, is a combined Presbyterian and Episcopal congregation and is on the National Register of Historic Places. John Page, executive director of the South Wedge Planning Committee, says the church is an institution in the neighborhood. "It's something that people relied on for many years," he says. "We're afraid of what happens next. If it's not a church, if it's not the same facility, what happens next? And how do you develop a site like that, that's so tight?" The church takes up just about the entire corner lot, with little space left over. It's surrounded by housing. The congregation does want to keep its popular emergency food program and community garden going, no matter what happens to the church, Wilkinson says. The program serves residents throughout the city.